INFO: “Hans” is the pet of the week at your Rancho Coastal Humane Society. He’s an 8 year old, 10 pound, short haired cat with a blue and white coat. He’s an “all things to all people” kind of guy. Hans is social and talkative, yet laid back and affectionate. Hans was transferred to RCHS from another animal shelter through the FOCAS program. Even though he likes other cats, he still needs to be in a home…not in a shelter. 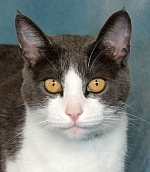 Meet Hans at Rancho Coastal Humane Society, 389 Requeza Street in Encinitas or log on to SDpets.org. Call 760-753-6413 for more information or to sponsor Hans until he’s adopted. Kennels and Cattery open 11 AM to 5 PM Wednesday through Monday. “HANS” is the adoptable Pet of the Week at your Rancho Coastal Humane Society in Encinitas. He’s an 8 year old, 10 pound, domestic short haired cat with a blue and white coat. If you’re thinking about adding some kitty love this holiday season, you really should meet Hans. Hans was transferred to RCHS from another animal shelter through the FOCAS program. He can fit into almost any home. He likes other cats. He’s laid back…but still very social. He loves being near people so he can “talk” to them. Hans loves sitting on laps and having people pet him. He’s also happy to sit by a window and watch the birds outside…right up until his eyes are too heavy to keep open…and he drifts off into a cat nap. The $145 adoption fee for Hans includes his medical exam, up to date vaccinations, neuter, and microchip identification. Find out how you can adopt “Hans” or sponsor him until his new family finds him and takes him home. Call 760-753-6413…log on to SDpets.org…or visit Rancho Coastal Humane Society at 389 Requeza Street in Encinitas. Adoption kennels and cattery are open Wednesday through Monday from 11 to 5.